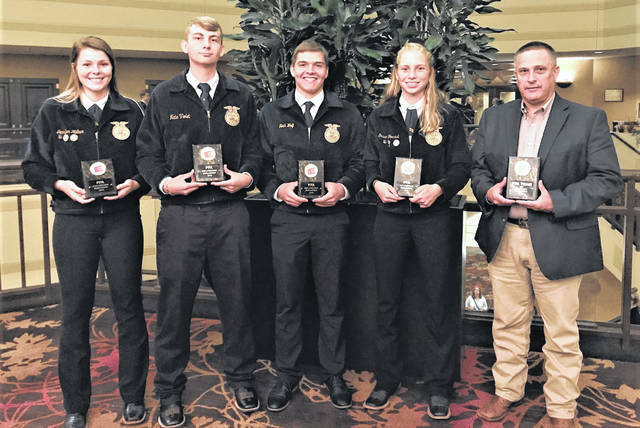 From left are championship Mechanicsburg Livestock Team members Jennifer Wallace, Nate Violet, Noah Wolf and Grace Forrest with Coach Kevin Neer. From left are Mechanicsburg Dairy Team members Max Hoewischer, Gloria Terry and Kenze Hoewischer. 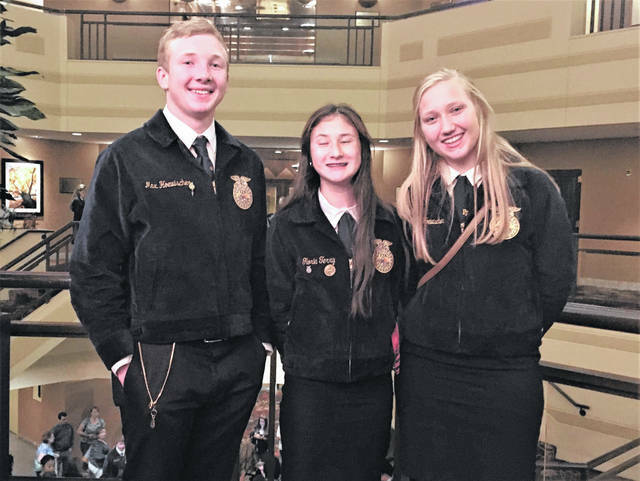 MECHANICSBURG – The Mechanicsburg FFA General Livestock and Dairy teams competed in the Big E livestock competition in West Springfield, Massachusetts. In the spring both teams finished 4th in the state. As a result of that finish both teams were rewarded with a trip to the Big E.
The Eastern Region Exposition, better known as “The Big E,” is a Sept. 14-30 fair organized by the states of Massachusetts, New Hampshire, Vermont, Connecticut, Rhode Island and Maine. Mechanicsburg’s General Livestock team won the contest. The team was led by Grace Forrest, who finished in first place as an individual. Noah Wolf was the second high individual of the contest with teammates Nate Violet in third and Jennifer Wallace in fifth. The Livestock team judged nine classes of sheep, cattle and pigs. Oral reasons were given on three classes. The team also had two team activities and a 50-question test. Mechanicsburg’s Dairy team also competed at the Big E, finishing in 6th place. The team judged six classes of dairy cattle and gave two sets of reasons. A team presentation was a big portion of this contest. Gloria Terry led the team, finishing 11th as an individual. Kenze Hoewischer was 16th and Max Hoewischer finished 21st. The Livestock team is preparing to go to “The Stockman” in October.